Chipping can sometimes be as confusing as playing golf on ice! Recently, I have worked with a number of golfers on their chipping technique. In these cases, one of the two hands were too dominant during their chipping action. Resulting in blading and duffing chip shots. After some discussion and practice, we use the following drills to add balance/feel/touch to their chipping technique. Lead with the left arm through the shot and then release the club correctly through the shot. During the chipping action sometimes the bottom hand on the golf club can early release or we can better describe this action as flicking or too much lower hand. This action may also feel that there is scooping or lifting action at impact. Or, you might feel that you want to help the ball up off the ground rather than letting the club do the work for you and swing the club through the shot. You can play around with your ball position, front middle and back of your stance. What you will notice is the difference in the ball flight and how the ball bounces and releases. The drills: Left and right-hand pitching drills or also known as the top and bottom hand drills. The top and bottom hand drills are a great way to feel how your arms and hands should feel at impact/follow-through positions during your chipping action. The drills may feel strange at first, but after a number of practice shots & practice swings, you will get used to it. Some key features to be aware of is to stay relaxed, light grip pressure, keep the swinging tempo nice, easy and gently accelerating through the shot. Top hand on the club drill (left hand for right-handed golfers and vice versa for left-handed golfers). The key feelings to notice here are a relaxed arm swing, allowing the weight of the club to continue swinging through the grass. Allow or help your body/chest/hips to rotate more through the swing. This sounds a lot more complicated than it is. To feel this action, practice the pitching swing in a mirror and watch how your body & club moves through the shot. Use and practice with your favourite club for chipping. One terrible way to practice is hitting ball after ball in the same place. I strongly recommend changing your intended target after every couple of shots. Make plenty of feel-good practice swings and keep going! Place 5 balls in a line starting from 3 yards, 6, 9, 12, up to 15 yards from the chipping green. The goal here is to chip the balls close or hole-out with a solid/centred strike. Move to the next ball and change the angle off the club face. You can choose to add or reduce clubface loft by opening or closing the clubface. However, test how the ball reacts from the varied club face angles. You can make longer swings depending on the distance and loft created on the club face. Continue this approach for all 5 shots. Repeat the drill with different the opposite hand with different balls positions as I have mentioned in the set up to improve feel/touch/distance control. Another goal is to feel relaxed and let the club swing through. 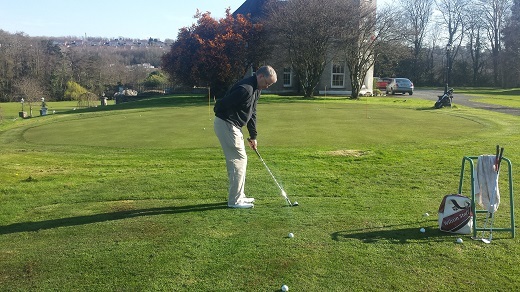 Keep practising and click here to view golf swing tips on pitching from 80 yards. Notably, repeat the above steps and should you require more information. 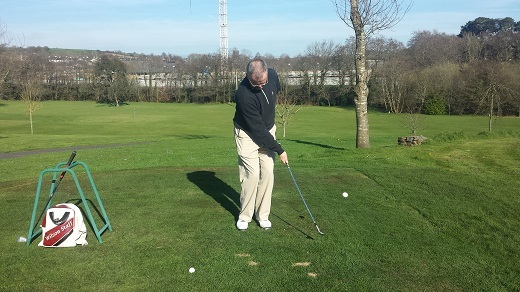 Feel free, to contact John Dooley at 0879277997 to book a series of chipping lessons and work on chipping drills.